After scoring a combined 73 points in their regular season meeting, the teams scored a mere 10 points by the end of the third quarter, with the Patriots leading 7–3. The Patriots' record-setting offense gave up five sacks and one lost fumble, while the Giants' offense managed only five first downs in the second and third quarters. Yet in the fourth quarter, quarterback Eli Manning threw two touchdown passes, including the winning drive that culminated with a 17-yard touchdown to Plaxico Burress with 39 seconds remaining. The game marked the first time that a previously undefeated team had lost in a National Football League championship game since the 1942 Chicago Bears as the Patriots fell shy of their bid for a 19–0 campaign. On the Giants' first drive of the fourth quarter, Manning completed a 45-yard pass to rookie tight end Kevin Boss. Following three runs by Bradshaw and a 17-yard reception by Smith on third down, Manning finished the 7-play, 80-yard drive with a 5-yard touchdown pass to David Tyree, giving New York a 10–7 lead with 11:05 left in the game. On the ensuing kickoff, Raymond Ventrone tackled Domenik Hixon after a 14-yard return, giving New York the ball on their own 17 with 2:39 left and three timeouts remaining. Following two receptions by Toomer for 20 yards, Brandon Jacobs kept the drive going with a 2-yard run on 4th-and-1. Two plays later, on 2nd-and-5, Patriots' cornerback Asante Samuel had a potential interception on a ball intended for Tyree that would have potentially ended the game go off his hands and out of bounds. This set up 3rd-and-5 for the Giants from their own 44 with 1:15 remaining. 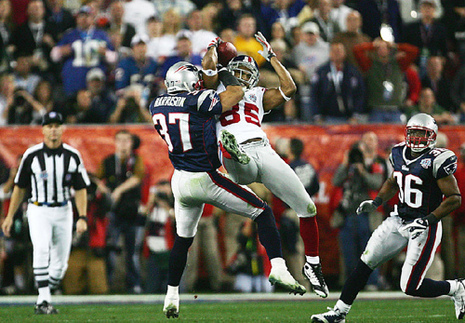 Manning spun out of the grasp of lineman Jarvis Green, righted himself, and threw a 32-yard completion to Tyree, who made a leaping catch while covered by Rodney Harrison and maintained possession by pinning the ball against his helmet with one hand as he fell to the ground. The amazing play (dubbed "The Helmet Catch") kept the drive alive. Three plays later, on 3rd-and-11, Manning found a wide-open Smith for a 12-yard gain to the New England 13, who stepped out of bounds to stop the clock. On the next play, the Giants sent four receivers into the pattern while the Patriots sent six pass rushers after Manning and flipped four pass defenders to the right side of the field—resulting in Patriots' cornerback Ellis Hobbs being isolated on the left side to cover Giants' wide receiver Plaxico Burress one-on-one. Hobbs bit on a fake slant inside (a "slant-and-go" or "SluGo" route) and Manning lofted a pass to the end zone where Burress caught the ball for a touchdown to complete the 12-play, 83-yard drive and give the Giants a 17–14 lead with 35 seconds left. New England began its next possession on its own 26 with 29 seconds remaining and three timeouts, but the Giants' defense didn't allow a single yard, forcing an incompletion on first down, a 10-yard sack by rookie lineman Jay Alford on second down, and then two deep incomplete attempts to Moss, the first that was broken up by Webster, and the second of which, on 4th-and-20, was broken up by Giants' safety Gibril Wilson and caused a turnover on downs with one second remaining. After the incompletion, the game clock briefly read zero (one second was re-added), and coaches, players, reporters, and fans crowded the field as if the game had ended. Belichick hugged Giants' Coach Tom Coughlin at midfield, then left for the locker room. This early departure was later criticized by some sportswriters. GLENDALE, Ariz. -- There was a palpable expectation of history here on a chilly night in the Arizona desert. 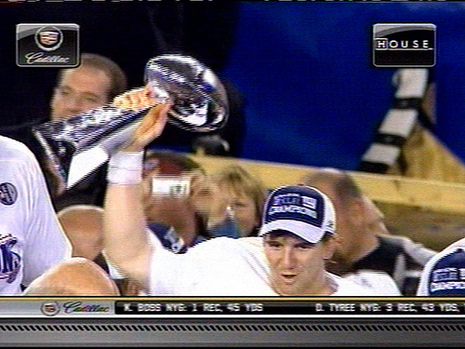 Super Bowl XLII delivered on that score, but history of a different sort than predicted was made Sunday. The Giants, 12-point underdogs, ruined the New England Patriots' quest for a perfect season. 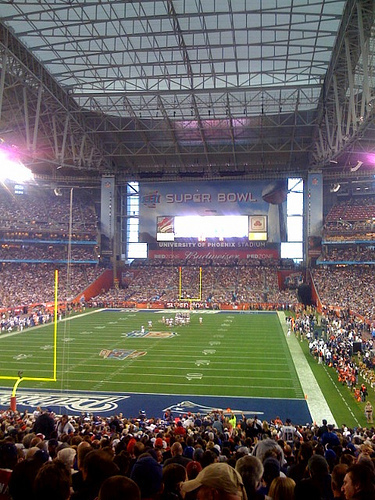 New York, which lost six of 16 games in the regular season, prevailed 17-14 at University of Phoenix Stadium. Quarterback Eli Manning, the game's MVP, lofted a regal, floating 13-yard pass to Plaxico Burress -- over Patriots cornerback Ellis Hobbs --- to put the Giants over the top with 35 seconds left.